Springfield Township officers process the scene of Saturday’s shooting in the Springfield Mall parking lot. 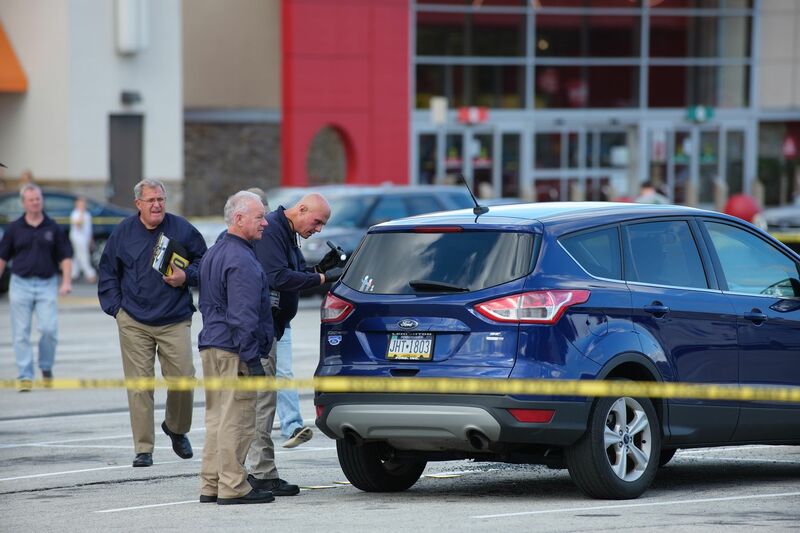 Springfield Mall reopened Sunday as police continued their search for the men involved in a fistfight there Saturday that escalated to gunfire in the parking lot and the evacuation and early closing of the popular Delaware County shopping spot. In a news release Sunday, Springfield Township Police recounted one especially terrifying experience for a woman who had been sitting in her vehicle when she heard gunshots. Police said she crouched down, opened the driver's side door and ran toward the mall. Her vehicle was struck twice, according to the release. Police could not be reached Sunday to confirm whether the vehicle was hit while the woman was inside it. In all, four vehicles were struck by bullets, police said. None of the others were occupied at the time shots were fired, said police, who recovered shell casings from the scene. A silver Dodge Grand Caravan, its rear window shot out, was impounded and the person who was driving it Saturday "is a person of interest in the case," said the news release from police. Police did not disclose what type of guns were used. The terrifying episode started with a fistfight inside the mall on Baltimore Pike about 1 p.m., when, police said, two groups of males exchanged blows on the second floor. Witness accounts and surveillance footage showed the combatants leave the mall and head to vehicles in a remote area of the parking lot, where two males exchanged gunfire. After the shooting ended, one of the vehicles, a silver Nissan Altima, exited the mall onto Sproul Road, police said. Numerous witnesses said all involved in the shooting had left the area. Philadelphia-based PREIT owns the mall property in a venture with Simon Property Group of Minneapolis.